My SoCal friends — who else has been loving the longer days & warmth lately?! I know I have been. As I pack up for my move to Palm Springs in a couple weeks, I have officially stored away all my winter clothing. Now, my closet is fully transitioned into SPRING MODE! I have several must-have wardrobe items for the new season. One of them is a versatile bag that will look chic with just about any casual outfit. These days, I can’t leave the house without my everyday spring tote by Jackson Wayne. This tan leather bag is so practical in a plethora of settings. I can take it out on client meetings, road trips, and even out to the farmer’s market to pick up fresh flowers for the week. It makes for a great carry-on bag for travels, too! Inside the bag, there is a smaller pocket ideal for storing loose cash, a phone, and other personal items. This makes it easier to locate the littler things. Despite its vintage style, the tote is extremely durable. 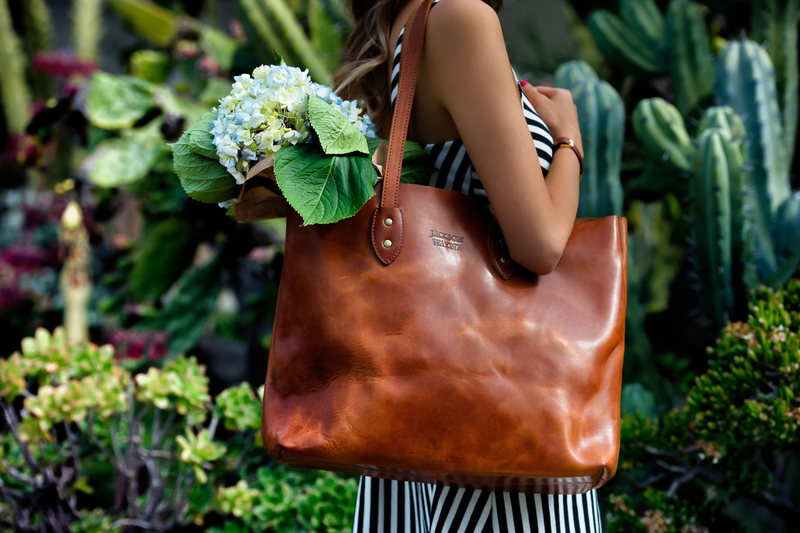 This tan beauty is made of the finest leather, thread, and hardware. For its size, I expected the bag to be a lot heavier but contrary to my belief, it fits a small-framed girl like me perfectly! Jackson Wayne is well-regarded for using only the highest quality full grain leather. This means that with extended wear, there may be some naturally occurring creases and scratches. These minor markings are not bad, though! Instead, they make each and every bag unique to its owner. Speaking of unique, the leather has natural color variation. Even though two bags may be in the same color, the leather may look slightly different in its own way. What’s a Spring essential you can’t live without this year? oh my goodness i love that dress on you! 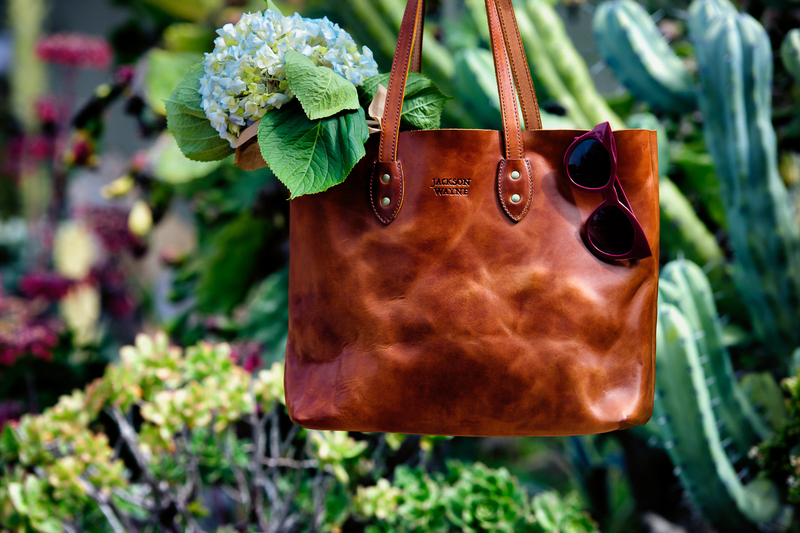 and yes, that tote is definitely a classic/must-have for spring. does this style come in other colors? I need that bag in my life!!! It does look really practical and would go well with just about any spring outfit. I love bags that can store a lot of stuff so will definitely have to look into this one 🙂 ive never heard of Jackson Wayne before though so thanks for sharing! Oh dear! Sharon, hun, you hit my soft spot. I am obsessing over totes and just “happened” to buy a tote or two at Gucci a while ago when I felt down to cheer me up, haha. This Jackson Wayne tote looks like something right up my alley with the brown beautiful leather and I would wear that as an everyday tote too! Thanks for the tip about this brand I didn’t know before! So jealous you’ve fully transitioned to Spring!! It looks so warm and nice 🙂 hopefully NY stops playing games and gets Spring-y soon too! I love that spring tote! It’s the perfect accessory and the color is so warm and cheery. PS is that a sheep on your necklace?! So cute that it pairs will your signature logo!! Thank you Mariann! This bag is a must-have for sure! I love your outfit in this post. I am so excited for spring, by the end of spring I have bought about 50 pairs of sunglasses. After looking at these pictures, I’m really excited for spring! And that bag is gorgeous!! Love the color of the leather bag! Especially love it with those stacked clog sandals. So cute! Love the Maison Jules dress. You always find such pretty styles from there. The style tips are really amazing, and the dress, the tote are really bueatiful. This tote is amazing! I love how it has so much character! And that dress! I love it! Looking good, sis! Love a tote bag and the brown tan colour looks great in the spring and summer season! Thanks for sharing. That is a stunning bag. I have one similar in style but the leather on yours is absolutely gorgeous. Since I’m in Vietnam for a trip, I have a new linen jacket that I love. Perfect for covering my arms in the hot sun or keeping me warm when there’s a little bit of a chill. Thanks Leiha! A linen jacket sounds divine for hot weather! Ahh….I love everything about this tote! First of all the classic, simple styling, combined with the fact that it’s more than large enough to hold all the essentials, including a lap top. Yes! I take my Macbook in this one and it’s great! Definitely the perfect bag for every traveler and on-the-go gal 😉 haha I think you’d love it! What a gorgeous bag! It’d be perfect for spring and it’s also great for every outfit! Love how that dress looks on you! The necklace is a nice touch! Thank you Bryan! 🙂 A sheep necklace will add a nice touch to just about any outfit 😉 haha! I think I could refresh each article just to wait till the pictures pop out again. Haha I love your theme. YOur dress and handbag are just beautiful. I loved every second of reading this. Awww you’re so sweet! Thanks for stopping by Bel! you have such a lovely blog, these photos are so lovely! This leather tote is a dream! I’m always look for a large enough bag that’ll fit all my things but still look chic at the same time. The shade of leather is gorgeous and really does look high quality! Thanks love! It comes in black too and I am tempted to get that for fall/winter haha even though we’re just now getting into Spring! I love this purse and the fact that it’s versatile eneough for work, client meetings or a farmer’s market jaunt (hate carrying grocery bags to the farmer’s market!). Super chic! Love this tote! It looks perfect for everyday use and I definitely might end up purchasing this one! Also, I am so jealous that you got to put away all your winter clothing – I’m on the east coast and it is still COLD here, so no putting away winter clothes yet! I am counting down the days to spring. I love that tote and the dress is so cute! You look great! This bag is so stylish and versatile! I think the size is perfect to carry all of my mommy gear and laptop for on the go blogging! I need one! I also love your striped dress! Such a babe you are! i am drooling, what a beautiful bag…and i’m a sucker for stripes too–cute dress! Wow! I really love your bag babe and also your casual look! I’m also eyeing for pure leather bags because they stay longer and durable! You look even more stunning lately babe! Take care always! Gorgeous look! Love the dress and bag! Your dress is uh-amazing, it’s flattering on your skin and the bag is so versatile and stylish. This tote is THE CUTEST!! I am so excited about your upcoming move babe! PS is such a fun location!! Hope your move goes smoothly! You’re making me so excited for spring! I absolutely love your entire outfit and the tote makes it perfect. It looks like you can carry so much in that. I have a small handbag fetish. I absolutely love that tote though! I can already picture all the different settings in which I could use this. I’m usually for the smaller ones too but I am loving this one more than I expected! That bag is gorgeous! It looks like it will go with so many outfits. The color, the leather, the style…..so me! What an absolute beautiful tote and I can see why it is a must have. I like that it has a smaller pocket on the inside because I am forever losing things in my bags without one lol I was looking at a new Coach bag to add to my collection but I think you have changed my mind. I can’t get over how perfect I think this is! I’m such a fan of large totes because I love to carry my life around with me including my laptop, iPad, notebook and camera and anything short of a suitcase and I won’t be able to carry everything. I actually love the natural wear of this bag Sharon and I’m so excited for your new move girl!! I can totally see why a large tote is a must for you! You are always on the go and these types of totes are great for holding all the essentials and more 🙂 Thanks darling! I recently bought a tote in a similar color and style and I wear it nonstop! Such a versatile color and bag to wear for everyday! It would be great for travelling too because of the size! It’s amazing isn’t it!? Seriously game changing haha! Firstly, I’m totally new to your site and I’m obsessed with your look. I love the tote bag tons. I love roomy bags with character and I love that it has that “worn in” feel to it!! Hi Sharon, you look stunning in this stripe dress and I love the tote as well. It looks so roomy! Thank you Miri! It is extremely roomy! what a cute tote! I love how the flowers look in them! spring vibes! Girl, you give me #GOALS! Love your outfit, so feminine and classy! I am a sucker for a great looking bag and this is one great looking tote. You look so gorgeous, just like always Sharon!! Love that classic striped dress, and it pairs perfectly with that tote! You’re so right! The tote looks like it would be so perfect for everyday use in the spring and summer time 🙂 Thanks so much for sharing! The weather in this picture is making me so jealous! you look so pretty in this dress and that bag seems to be so practical. I love the colour and it is the perfect bag for running errands everyday! Haha thanks love! It’s actually been on and off here in LA… getting gloomy today with a chance of rain! Woow I love the striped on your dress. Such a cute outfit babe. Love this stripes dress on you, and that bag is so cute. I have a black tote that is basically glued to me I use it so much! Not only are totes stylish, but so practical as well. Hard to leave it at home now! I can see why! lol! Very cute bag! I love it! And your pictures are wonderful. All of the plant life is perfect in the background. Thank you Lara 🙂 I actually didn’t change my hair! It’s just grown out so much now I need to get it touched up LOL! How nice! I love the tote and the dress. You look amazing. I love that bag!! The colours and distressed look is fab. You paired it perfectly with your outfit. Wow full spring mode!! Here in Vancouver, we’re like 50% there, 50% holding onto winter lol. You look lovely! Haha it’s actually a little chilly here in LA today and expected to rain in the afternoon! The weather has still been a bit whack here as well haha. i love your dress against the bag, such a nice contrast! Thanks Mary! I’m all about nautical stripes this spring. So jealous you are in the spring transition, it is freezing in NY still. This tote is seriously so gorgeous and seems so practical, we love the color! Thank you ladies! I am super blessed that it’s finally spring and feeling that way haha. I am not a fan of winter. Hope it warms up where you are soon! Your bag is lovely, but I like your dress more! <3 You look fab! Nice look for the spring babe! You looks so stunning, i’m in love with this sandals! this is such a gorgeous, classic look! I love the black and white stripes on that dress and the worn-in tan leather bag is perfect! Such a beautiful bag and so practical babe. I love the colour since can work for any seasons and the size since its perfect to fit everything a girl need now days hahaha. Will have to check them out.You look stunning in all the pics. Thanks Marcy! Seeing as how you travel so often, I think this bag would be perfect for you too! Thanks Andrea! I am super excited to be wearing open-toed shoes too! I love that bag!!! It’s so chic and practical. The dress is also soooo pretty. I have one just like that and I love it!!! You look absolutely gorgeous in this look, babe! I love that tote bag. The leather is so beautiful. It definitely looks the perfect versatile bag for everyday use. You looked gorgeous babe, and also your handbag! Am now checking online to grab mine too! That is a beautiful tote. Every girl needs a new bag to start the Spring. Thank you Hil! I couldn’t agree more. I just got myself another one too! Totes are seriously chic this Spring. Wow your bag is so gorgeous! I can totally see myself wearing it- it would go with everything! That bag is beautiful! It is so my style and I would use it everywhere and not just in the spring! Thanks Janine! The bag would be perfect for you! You are so perfectly dressed for a day in the sun. That bag is so classic and it really fits your frame well! I actually love leather that wears well naturally and this one looks so nice. Happy moving babe! You must be so excited! Giiiiirrrrrlll,,,, I LOVE THE OUTFIT from head to toe!!!! The striped dress paired with that gorgeous tote and those heels look spectacular !! I love how you mixed the black and white with a pop of brown. That tote looks like it fits everything a girl needs! Love love love. Yes!!! The rain has finally stopped here and I couldn’t be more excited to wear shorts, skirts, and dresses everyday 🙂 Thanks darling. I’m glad you like the bag too! Hon, I am soooo swooned. Like, can’t even start telling you how much I adore this look – it is probably one of my top 5 of your looks, babe. So so pretty! The bag is just insanely stunning & I love the dress’ print and defined lines. In awe about the shoe choice for this look – you rule, babe <3 Hope you're loving your new home, my sweetie. Love that tote, and your whole look! Such a great Spring post. What a beautiful bag, the perfect addition to any outfit! I love that it’s the perfect size for travelling! I could even fit my iPad in there! Glad you think so too! I love that bag. It’s gorgeous! Love the photos as well. I’m seriously obsessed with this look on you babe, perfection!! Really liked the bag and I love that dress, looks gorgeous on you. Where did you get it from?